So. Like most of my random philosophical musings, this one started from a quote from Rance Quest. "Girls are the world's treasure." Now while on the surface this quote seems to scream sexism against men, I found I couldn't help but agree with it; and so began the perilous adventure to find out why. Now the first thing I noted was that, coming from a male perspective, I held men and women to different standards when it came to respect. Now, this was not in the sense that I had a universal axiom that women were to act like X, while men were to act as Y; but that in the practice of my day to day life, I noticed that I would unknowingly hold certain attributes virtuous regarding my perception of men and certain other attributes virtuous regarding my perception of women; and it would be these attributes that I encouraged in people that I cared about. For example, I would hold in considerable esteem a man who balanced the development of both his physical and intellectual pursuits, than I would a man who favoured one over the other. This did not hold true the same with women, where I would place no weight on how the woman in question balanced her physical and intellectual attributes. Instead my focus in regards to respect would be on different qualities that the women may pertain, qualities of which I would likewise ignore if they were displayed in a man. After observing and breaking down my set of prejudices towards the sexes I noticed that the type of man I gravitated toward offered me stability, while the type of woman I gravitated to offered me an emotional investment. This led me to the conclusion that engagement with men was a necessity, but engagement with women was a luxury. You see, (assuming stability to be valuable insofar that it is a necessary component of wellbeing,) if men offered me stability, and women didn't, then what women offered me was something on top of that stability, something valuable insofar as it was luxurious. So to say "Girls are the world's treasure," would be to assert that "Girls are (the most) luxurious thing," the superlative nature of this statement is based on an individual's perception of what women have to offer; in Rance's case, it is believed that the luxury of what women can offer him is superior to any other kind of reward. 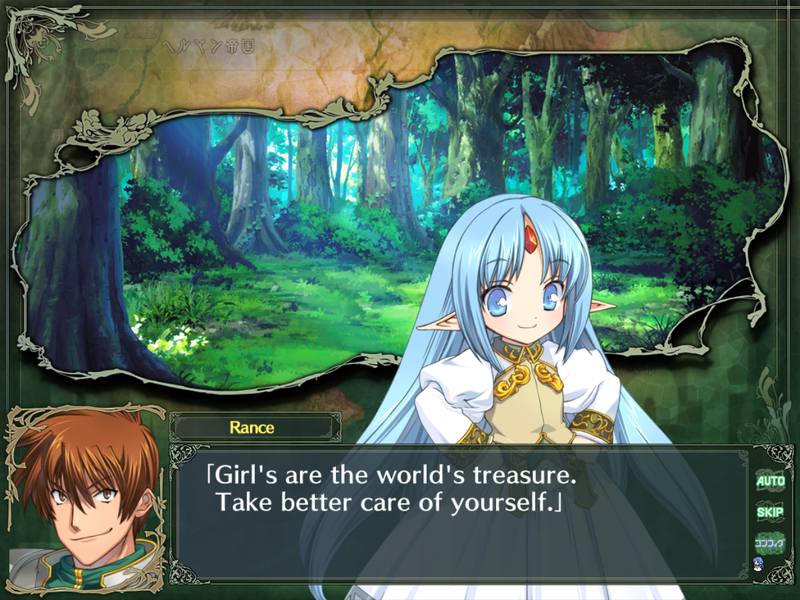 However, we must take heed to notice that Rance is praising "Girls" as luxuriously valuable, and not "Women"; this distinction is what changes the statement from a sexist one, to a sensible one. You see, if an Adult has the potential to be luxurious, and luxury is valuable, then it follows that each Adult we come across will be either a valuable Adult, or not a valuable Adult. In the case of a Child, every Child does not have the potential to be a valuable Adult, but has the potential to become a valuable Adult. It is from this that we can draw that Children are valuable, not because they are inherently valuable, but because they hold the potential to be nurtured into something valuable, which an already fully grown Adult does not; therefore, it is more likely that a Child become valuable, than a Adult be valuable. "Take better care of yourself."